In 31 of our 32 school libraries, we have have a certified school librarian (or certified teacher working on his or her degree) in place. In our district, we do have one particular school with some of the most dedicated professionals I have ever come to meet. 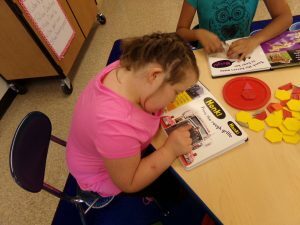 Stoner-Thomas is a school for nearly 100 students with special needs in grades K-12. More than 30 staff members are employed in various capacities to meet the needs of those students…but no librarian. When I became the lead librarian for our district 2.5 years ago (a brand new position), I decided to “adopt” Stoner-Thomas Library Media Center. State of the Library (2015): Because our district allots a book budget based upon student enrollment, Stoner-Thomas had a very small budget each year. 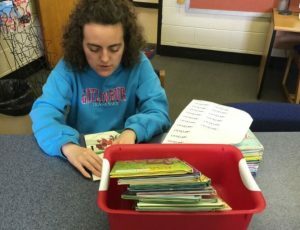 They do, however, receive donations of books from the community, but the library lacked organization that made it virtually unusable for just about anyone. What books were cataloged were done so haphazardly, which made searching for books using Destiny almost impossible. The books were dated and the space was used primarily for storage and meetings. Construction delays (2016): Stoner-Thomas was headed for some major renovations, adding new state-of-the-art classrooms, updated bathrooms, and adding a new cafeteria and a handicapped-accessible playground. The library media center, having been useless for so many years, was on the chopping block. Administrators were going back and forth about whether or not to even bother with it. The contents of the library media center were packed up and repurposed, and the space used as a temporary classroom during construction. Construction completed (Spring 2017): Finally! With much advocating and persuasion and the promise of making the library more accessible, we were given the opportunity to move forward with the library re-boot. 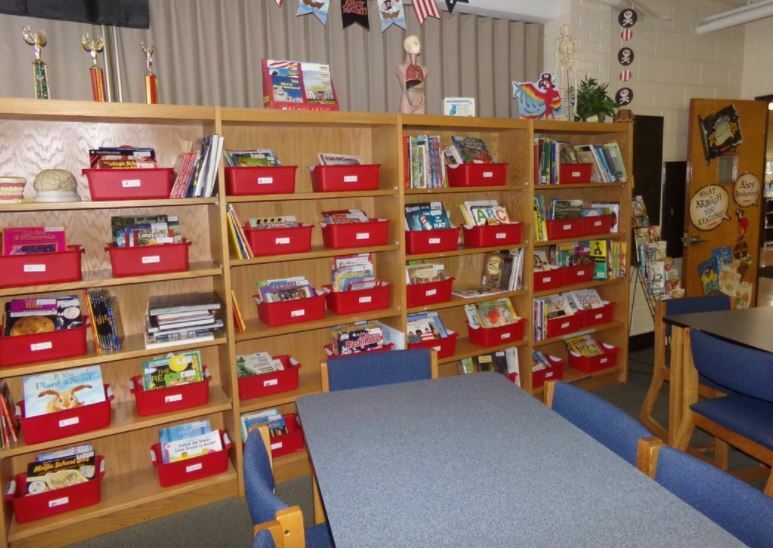 Because we were able to start fresh, Kathy Lankford (the library assistant) and I were able to weed through the boxes and reorganize much more easily. Weeding: First on the list was sorting through the books and discarding those that were outdated, falling apart, or the reading level was too high. There were a number of boxes of books that had been donated since the library had been packed up so we were able to sort through those as well. 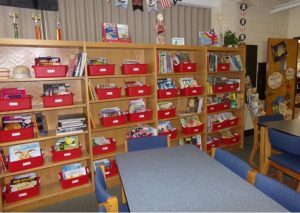 Genrefying: We decided to organize books into categories, much like genrefying, but we included non-fiction titles as well. Instead of traditional genres, we had categories such as shapes, colors, counting, transportation, pets, reptiles, weather, and North Carolina books among others. Book bins: We advocated for some local funding to buy some nice, red book bins. We ran out at 40 and the PTO (another amazing group!) purchased a few dozen more. We gave each category a bin. Labels: We purchased some really nice full color labels from Etsy and downloaded the file. We printed hundreds of labels (30 per page) and put a page in each corresponding book bin. Kathy blew up the images and made large matching labels for the front of the bins. She now keeps the files handy so she can print extra copies at any time. Easy-access: In the past, students were not allowed to bring books home because many times they were not returned. Teachers struggled to use the catalog because it wasn’t set up properly. Browsing for books was time-consuming and it was difficult to find a particular title or topic. Because it was so inconvenient, students and staff stopped using the library. We decided to abandon Destiny (yikes!) and try the honor system. So far it’s working! Making it more attractive: The addition of red bins and being able to see the covers of the books was instantly more attractive. Kathy searched the maintenance building and found some old book shelves she wanted for the space. Maintenance refinished the furniture, hung up new shelving and installed new bulletin boards. We added some fun pirate decorations left over from the Scholastic book fair and from the clearance rack at Hobby Lobby. Some throw pillows were added to the soft seating in the reading nook. Build it and they will come: Staff and students used the library as a cut through to get from the new building to the old building, so they got to monitor our progress as we went. Finally, when we were done, students and staff both flocked to the space to search for books! A few of the students in the upper grades requested to be library helpers and Kathy put them to work. They come in the library a couple of times a week to dust and straighten shelves, reshelve books from the book return, and label new books. In fact, this group of students is nearly single-handedly maintaining this space! The library is now a popular place to read with friends, teachers, and mentors! Funding: In addition to the funds allotted by the district, we recently held out 3rd annual book fair, which yielded a tidy sum of $780 Scholastic dollars. To improve sales, we advertised to central office and the sheriff’s department that are just across the street. We also opened during the Trunk or Treat event the week before the book fair which gave us some added exposure. And just last month we created a Donor’s Choose campaign to purchase some more touch and feel sensory books for our autistic and visually impaired students. The campaign was created on a Tuesday, funded 24 hours later, and the first shipment of books was received on Friday of the same week! We plan to do some more Donor’s Choose campaigns in the near future and have already booked our book fair for next Halloween. In summary, these few changes didn’t require a whole lot of money. Instead it took some time, some creativity, and some innovation. The Stoner-Thomas library media center is now a destination and not an afterthought. If you have other ideas about how to make school libraries more accessible for those with special needs, please comment below. Amazing Sedley. Thank you for being a champion for Stoner-thomas students. Thank you for all of your hard work on behalf of these students, and saving their access to a library! I’m wondering the age distribution and types of disabilities at Stoner-Thomas. Is this geared to students with learning disabilities or more physical disabilities? What are the general prognoses for the children? I guess I’m curious as to the overall nature and severity of disability of the population. We have some special ed students who have high reading levels, but other behavioral, developmental issues. Having an active database would help identify and match books more easily based on specific needs, and it may be easier to begin with a small collection rather than wait until it has expanded. Is the goal to have a browsing library for the students? To teach routines as well? Would it ever need to be searchable? Maybe the policies and organization could become more standard for the older and/or more capable students? They could go on field trips to a public library, too. 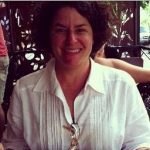 You’ve given me food for thought for how to think about the needs of our special ed students.